Eureka Police Chief Andy Mills. 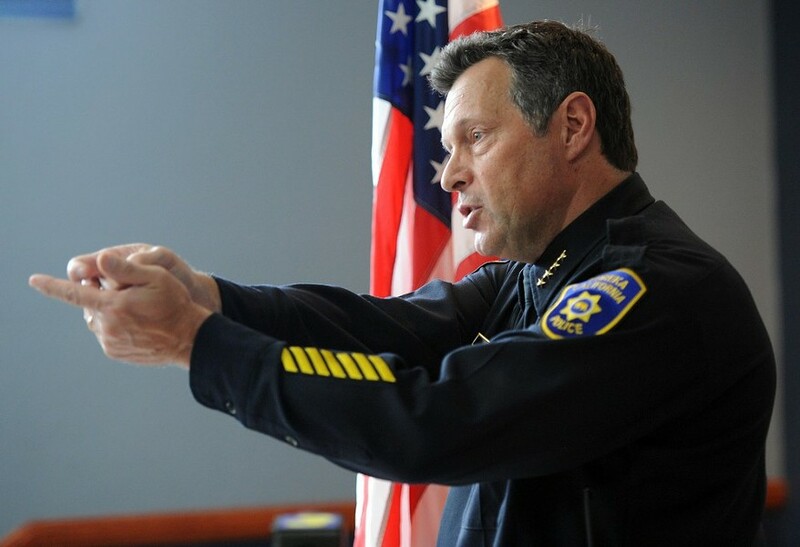 Eureka Police Chief Andy Mills has pulled his proposed gun control ordinance, saying his department is going to focus on an education campaign urging people not to leave weapons unattended in their homes and businesses. Mills, with guidance from the city attorney, had developed a proposed ordinance requiring gun owners to lock up their firearms when they were away from home or work. It was a response, he said at last night’s city council meeting, to gun thefts and gun violence. “When we have a city of 30,000 people and we have eight homicides since I’ve been here, that’s unacceptable,” Mills told the council. Mills rattled off a series of anecdotes about gun thefts in the area in the last year: 50 guns were stolen from a business, four of which have been recovered with criminals; 40 guns were piled up at another business before police officers interrupted the burglary; at a Eureka residence, 40 more guns were collected when police intervened; a Eureka resident returned home to have his own shotgun pointed at him by an intruder. Mills said 122 guns have been taken from criminals in the last year, 16 of them at the PalCo Marsh. He said he wants to get guns out of the hands of criminals, but he says he’s not interested in impinging on 2nd Amendment rights. Mills said he pulled the ordinance based on feedback from the city council and the public. Commenters on his blog post (and the Journal website) announcing the ordinance were uniformly against the restriction, though they also uniformly seemed to misunderstand that Mills’ ordinance would only require guns to be locked up when the owner wasn’t present. Mills said EPD is offering free trigger locks for interested people, and urged local businesses to offer discounts for gun safes. Councilwoman Marian Brady raised doubts that trigger locks would prevent criminals from stealing guns, saying that people have repeatedly cut through a chain link fence at a carpet store near the PalCo Marsh. Mills responded that any deterrent, no matter how slight, is an improvement — though he’d rather see guns put in safes or hidden panels when owners are away. Mills — who is scheduled to host a press conference this afternoon about a shootout on Sunday that left a CHP officer wounded and a suspect dead — said he’ll reintroduce the ordinance if appears the EPD’s education efforts aren’t effective. “We are markedly less safe when criminals find it easy to steal guns,” he said.